Beginning immediately, school boards across the state have new directives for the hiring of superintendents. According to a 2017 amendment, school superintendents must only come from districts with an “A” or “B” rating or a school that has made an improvement in rating during their tenure. This amendment inherently discriminates against majority black and rural low-resourced districts, disenfranchising teachers and administrators who vehemently hold up public education in the state. By placing a scarlet letter on struggling districts and stunting growth for career educators, this amendment disproportionately affects African Americans and women. The ACLU of MS is advocating for the passage of HB 753, which will rectify this effect by adding emphasis to professional experience as opposed to subjective, arbitrary criteria. Description: Scholarship for Hispanic and Latino Students pursuing a Bachelors or Master’s degree in Education for the purpose of recruiting and education certain qualified persons to teach in an area of critical need. Our Position: This bill supports fostering diverse educators in order to meet the needs of English Language Learners throughout the state. Increased diversity in educators creates equitable environments where all students can learn. Description: Mandate report to MDE of unlawful activity on school property and require MDE to provide evidence based training to improve school climate. Our Position: This bill would provide support to school districts who have an increased number of suspensions and expulsions. It states that MDE would provide evidence-based training to teachers and staff to help districts create a better school climate and lessen the likelihood of school-to-prison pipeline practices and policies. Our Position: We support this bill because it supports civic engagement for high school students who are nearing voting age. Given the low voter registration rates of Mississippians ages 18-29, voter education would help to increase that number as well as voter turnout. Our Position: This bill would establish a free universal Pre-Kindergarten program for every child in the state of Mississippi. Early childhood education is a key indicator of student success and creates equitable opportunities for Mississippi children. Our Position: Provides increased education funding to school districts across the state and creates equitable opportunities for more Mississippi students. Our Position: This bill would require school districts to hire social workers and psychologists in addition to providing funding for those positions. We support the hiring of additional student support staff that help to contribute to an equitable school environment. Our Position: This bill would give tax credits to individuals who have given money to public schools. We support this measure because these tax credits will help to provide additional funding to public schools. Our Position: The use of restraint and seclusion methods puts children at risk and does not keep them safe in public schools. This bill would limit the use of restraint and seclusion and require teacher training. We support this bill because all children should be safe in school environments. Our Position: This bill would require school districts to submit reports each year to the Department of Education by describing how the district utilized practices other than suspension, as it pertained to student discipline. We support this bill because school districts should be held accountable and encouraged to utilize alternative methods of discipline other than removing the student from the classroom. Our Position: This bill would require school districts to adopt specialized discipline plans for exceptional education students in order to ensure that proper IDEA guidelines are being followed for students who need additional behavior and academic supports. Our Position: This amendment removes language that unintentionally creates racial and gender discrimination towards persons seeking employment as superintendent. Education Professional should be able to advance in their careers based on merits, this amendment creates high standards for superintendent qualifications while also creating equitable opportunities for all educators. Description: Require school districts to report to SDE on positive behavior intervention practices. Our Position: This bill encourages schools to use positive behavior supports to improve student behavior and create positive school environment. The use of positive behavior supports the disruption of school to prison discipline policies that push students out of school. Our Position: This bill encourages the use of alternatives to suspension thereby dismantling the school to prison pipeline. Our Position: Supporting certified teachers in critical needs areas is essential to creating equitable educational opportunities for all students. Description: Require clear and convincing evidence as standard of proof for those more than 10 days. Our Position: This bill would require school officials to show compelling evidence to justify the removal of a student from the classroom setting. This bill prevents school districts from excessively and unfairly suspending students for extended amounts of time. Our Position: This bill would provide additional training and mentorship to rural area educators to improve school leadership. This bill helps creates equitable learning environments for rural schools and helps to build stronger leadership. Our Position: This bill asserts parent's rights to be notified of their child's placement in an alternative setting. Our Position: This bill would give additional arresting authority to school resources officers. SRO duties should only include those that focus on total school safety and should not promote the criminalization of student behavior. Our Position: The bill mandates the arrests of students by local law enforcement officers for offenses deemed violent in nature. It perpetuates the school to prison pipeline by criminalizing student behavior and authorizing arrest power to local law enforcement officials on school property. This does not keep Mississippi children safe. Our Position: This bill will unfairly fine schools who do not recite the pledge of allegiance during the first hour of the school day. 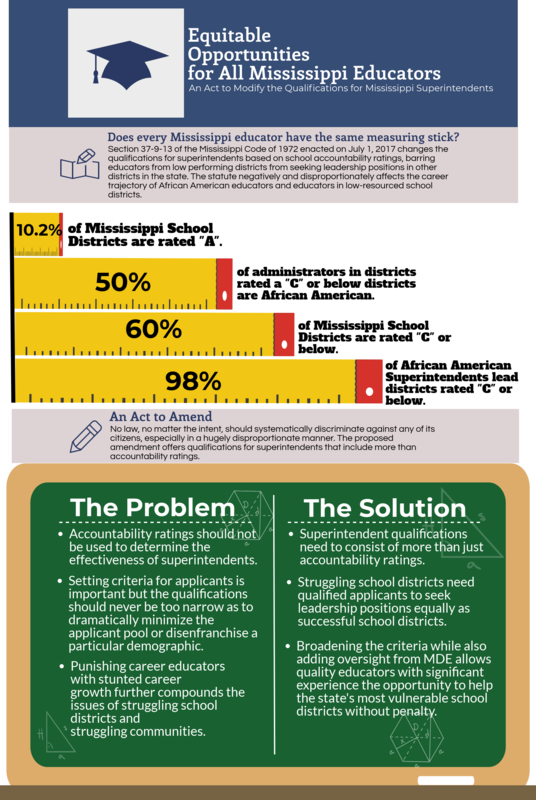 We do not support this bill because due to the lack of school funds in a majority of Mississippi school districts, fining districts for offenses unrelated to student success and performance is unnecessary. In addition, silent forms of protest is protected expression. Punishing schools or students for choosing not to recite the pledge is unconstitutional. Our Position: This bill would authorized the legal possession of firearms on school campuses for school personnel and school resource officers. We do not support this bill because school safety is the role of school resource officers and allowing other personnel to carry firearms on school property creates an unsafe environment for students. Our Position: This bill would require that funding for individual students follow that student if he or she transfers to another school. It offers no remedy for school districts who do not have the funds to pay, refunds for students who return to previously enrolled districts, or provide support for struggling districts who might lose an overwhelming majority of students. We oppose this bill because it creates systemic barriers to educational opportunities for all. Our Position: This bill allows school boards to choose which students can transfer into their district with no guidelines for districts on the criteria that must be used to determine whether a student is accepted. Without such guidelines, school boards can reject students for no just cause and in a discriminatory manner. Description: Require school districts to pay local funds due on quarterly, rather than annual basis. Our Position: This systemic issue creates a funding disparity that impedes on equitable funding practices. It mandates that public school districts pay charter schools based on per pupil enrollment on a quarterly basis. We oppose this bill because it does not include a provision for returning funds for students who transfer back into the public school system. This bill forces public school to pay charter school for students who no longer attend. Description: Authorize use of community service as disciplinary alternative to suspension and expulsion. Description: Prohibit SDE from reducing and redirecting local school district’s MAEP funds for purpose of.